After you install 30 plugins and spend years of learning it you can come close to an IDE, but you lost a lot of time, for nothing. If you would use an IDE in a proper manner (See Visual Studio or intelliJ) you will realize that your productivity is not about writing text (what Vim excels at), is at making your code work in the real world. Is more about development and less about being a type writer. the devs usually need to do DB queries, work with env tools, debug, see static analyzers warning, deploy dockers, run automatic tests, do merges, do huge refactoring that touches many files, find the "blame" on a bug, and so on (without writing or remember CLI commands or wasting time to setup the IDE). Just saying, as a "director" you should appreciate productivity and do not make "feels like home" decisions for work projects. Do not confuse "what I like to do" with "what I have to do, as a professional". By not using the proper tool, that gives you the fastest and most productivity you are wasting your employers money, so you are not being professional, you are just selfish. ^ This person is my favorite. I am actually using Vim, my point is that title of the post should be "Vim is the perfect IDE ... for me". Your personal preference is wrong... You are not more productive with your favorite tools. 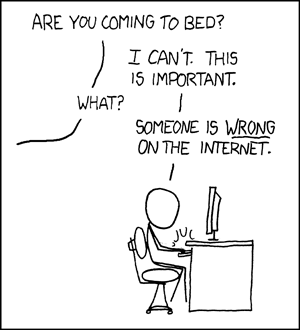 It's like telling someone "No, you shouldn't like chocolate", or "Your favorite movie is wrong". Chocolate and movies are indeed a matter of taste, but productivity is not (also note that 'feeling productive' and 'being productive' are two different things). That is the problem, he didn't specified it is a personal preference, he said it as an absolute truth and other people can make wrong decisions. This, so much. I downloaded VSCode, used a clean GUI to install a few plugins, and I was developing nodeJS in minutes. That vimrc convinced me to never use the editor for anything serious. VIM is a tool, every developer is entitled to its opinion and preference, VIM might not be the right fit for all stacks or all applications but I have successfully use it to work as you mention for writing, python development, elixir/erlang development. IntelliJ is great and I use it for other kinds of development (ionic for example); I find the knee jerk reaction to the size of configuration file a bit risible, the configuration file as shared has support for several languages, stacks and some of my personal customizations. Finally, I find that the ad hominem attack on the last part of your reply actually subtracts from what was actually some valid points on your argument. I just wanted to raise awareness on "VIM priests" that spread their false gossips around, I probably sound more passive-aggressive then it should. You just "forget" to mention that it is a personal preference, and state that "Vim is the perfect IDE" (for me?! ), knowing in fact that is not even an IDE and not perfect. You "forget" to mention that you spent maybe years of being prolific, where in IDE's most of the things "just works". they advance to bigger projects (as in scope and LOC count), and hit some walls. Then invest more and more time in their VIM skills and configs, and in the end being less productive. This combined with the fact that people hate change, leads to bigger problems once the developer gets involved in bigger and more complex projects. I just want to make things clear for the juniors and next generation of developers to make a big difference between "personal preferences" and "best tool for the job", and posts like this doesn't help at all. Please keep in mind that everything you've said so far is anecdotal. Others, such as me, may have different experiences. I tend to agree with BG. Tooling becomes vastly important when working with larger and more complex codebases. The kind of code analysis provided by actual IDEs simply cannot be replicated in Vim no matter how it's customized. Vim is great, but Vim is ultimately just a powerful text editor. BG is correct in that the anti-IDE stance is alluring for junior devs, providing false machismo in the absence of experience and well-honed skills. Stop comparing it to emacs. They are vastly different things. Let's distinguish Vim "the concept" from Vim "the application." Vim, conceptually, is mode-based text editing with consistent, highly optimized keybindings. The beautiful thing about vim-as-a-concept is that it's available in some form or fashion in nearly every IDE and text editor. "vim-as-a-concept is that it's available in some form or fashion in nearly every IDE and text editor." ... and browser. In my line of work, I've seen little to no benefit with static analysis. I am working on a highly dynamic codebase. Sure, if your language is static its great, but I really don't see this as being a reason for not using VIM. I've actually seen VIM autocompletion be more accurate than IDE's (for newer languages such as Rust). I am very curious in what languages/line of work there are no benefits for static analysis, can you give some examples? wow ok, your team is great then! I was part of teams that didn't used but we ended up regretting. I usually saw linters solving a lot of (very small) problems in large teams and projects, like (forces a coding standard, find small bugs like forgetting to type a var or forgetting a switch default, fewer git merges/conflicts) which leads to a better codebase in general (if you enforce the rules at commit/build). As a sidenote linters are builtin in most IDEs so maybe you use them already, but only at a basic level. We use eslint (for the older projects, a combination of jshint and jscs). The plugin I use for vim (ale) works with pretty much any kind of linter I've encountered. This isn't the sort of static analysis I'd expect from and IDE though, this is what I'd expect from any kind of programmers editor (vscode, sublime, etc). What I meant by static analysis is the ability to goto definition, display documentation, refactor, etc. This is the sort of stuff which doesn't work consistently enough with our codebase to even bother trying. "The beautiful thing about vim-as-a-concept is that it's available in some form or fashion in nearly every IDE and text editor." Personally I'm yet to find any implementations that replicates vim entirely. In every single one I tried I stumbled at something that just didn't work (often f/F/t/T, or ci( are missing, but even in the best "vim-mode" I've been working with so far there was something missing). "What I meant by static analysis is the ability to goto definition, display documentation, refactor, etc." You can have all that in vim. Look at YouCompleteMe. PS. I'm not trying to say vim is for everyone - it has a very steep learning curve, so unless you don't have time to spend learning it, stick to IDE. But for those who did learn how to use vim any IDE gets obsolete. Linux, the whole environment, is your IDE. 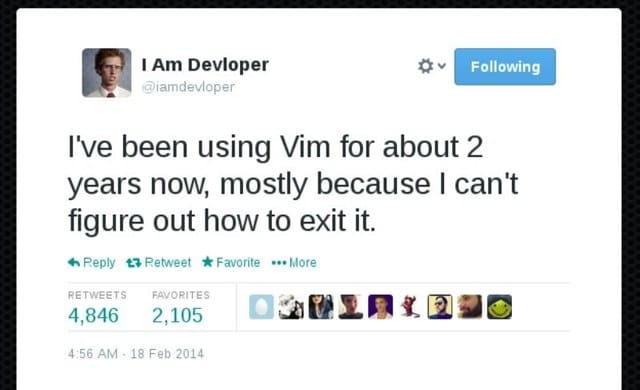 Vim is just one part of it.